Some of the summary topics you consider most important? Experience should be listed in reverse chronological order – first last place of work and in order to the first. If you have time to gain experience in various companies and the list can stretch on several pages – not worth to do so! Description career path should be specific and related to pretendemos posts. Recruitment in a company starts with consideration of their professional experience. To interest the recruiter and highlight your candidacy among other applicants instantly can information, specified in the column "experience" in the summary. Все сведения должны быть краткими и максимально красноречиво отражать требования вакансии. 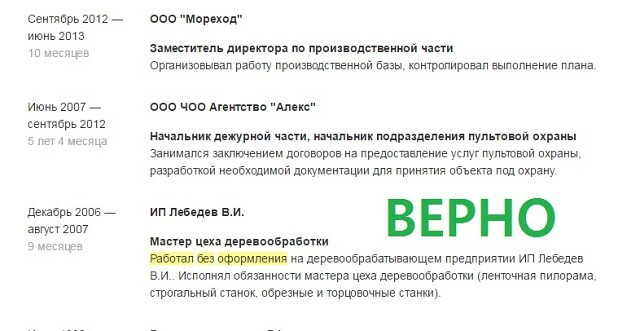 The point of this section just need to bring to the ideal state, наполнив его в полном объеме своими профессиональными навыками полученными во время труда. 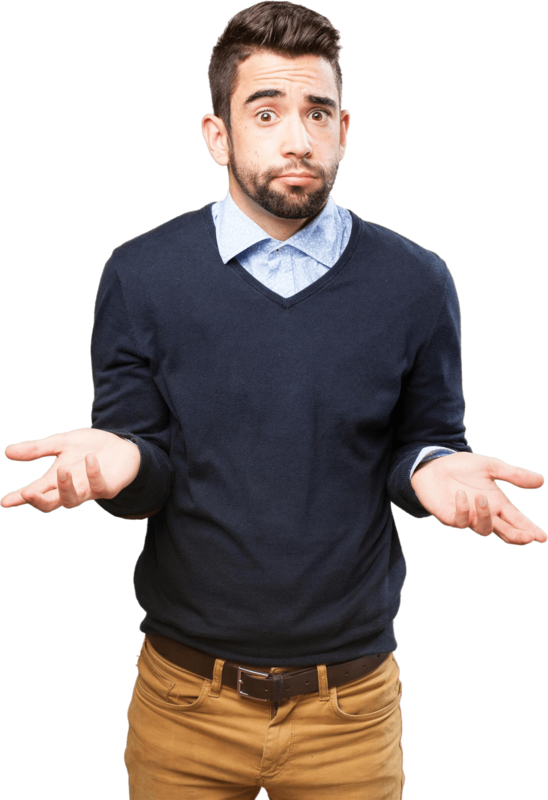 Casting a cursory glance summary, the employer will immediately become clear, he wants to see You at the interview or not. So every point you need to make perfect: be wrong You have no right! You should not resort to various tricks, embellishing your professional experience. Information must be truthful and accurate: it is very easy to check. Engage in describing all Your work experience should not. Specify no more than three last places of work. Write them in chronological order, placing last in the beginning. Specify not only the year, when they began or ended his career in the company, but a month. This allows you to avoid misunderstandings and will enable the employer to get an accurate idea of how long You held this position. So, experience in summary, example: «2015 – 2016 G. G.", will cause employers confusion. If the time of Your device to the company dated February 2015 year, and the termination date is in December 2016 year, Your experience for the position is 1 year 11 months. In the case of joining the company in December 2015 year and end of work in her in March 2016 years we can conclude, that You were in office only three months. Agree, the difference is palpable. Managers won't even consider a resume with incorrect data, therefore, inaccurate dates may be the reason, to reject Your candidacy. The prospective employer is not obliged to decode unfamiliar abbreviation. Hope, what the new boss will be like a set of unknown letters, not necessary, unless You were in the service to some famous company. In- first, write the full name of the organizations, do not use the abbreviation. The name should be a fully, unabridged. Don't count, что краткое наименование будет знакомо рекрутеру. Second, specify in what city, but if you want, and the country, in which an organization functions. Enter the specifics about the scope of its activities and headcount. Sample: OOO Gratium". 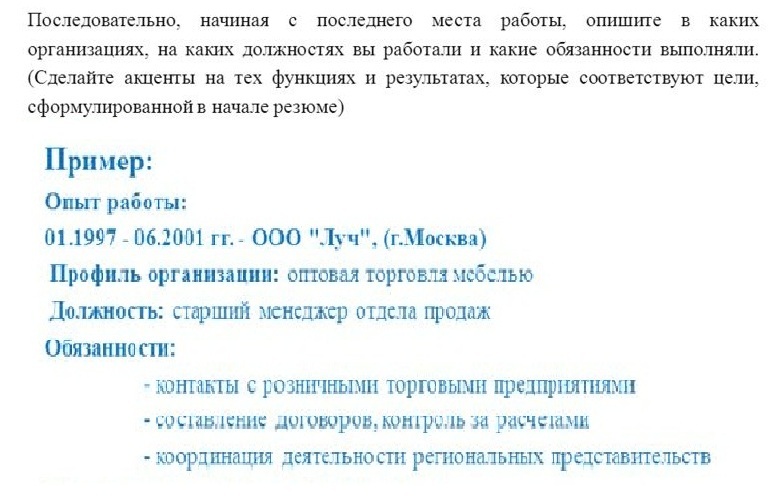 Manufacture and sale of concrete products (main office in g. Moscow). Штат сотрудников — 200 man". No need to hope, the title of the post will be at the recruiter an accurate idea about your previous job. Поэтому формулировка «инженер» или «менеджер» не принесет желаемого результата, namely, to be in higher positions. 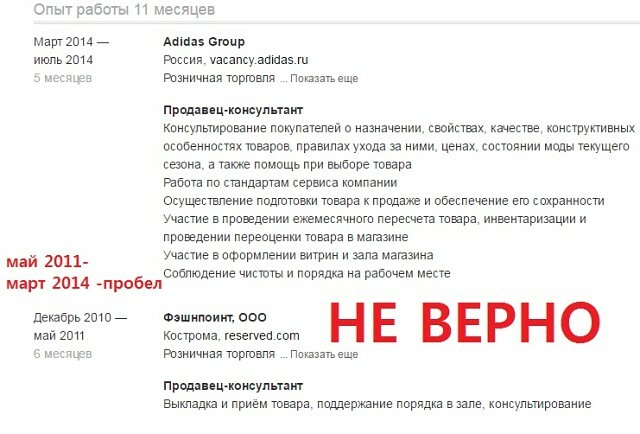 Here it is necessary to write so: "sales Manager", «инженер энергетик». Reflecting information about previously occupied the position you can begin to transfer what You do at a previous job functional responsibilities. You do not need excessive details. Write about the main. Present information clearly, clear, simply. So, let's start with, that the draft fully reflect Your career. The list should include all places, where You have ever worked with. Fully describe the roles of, которые выполняли в организации, and achievements. The following steps must be adjusted in accordance with the vacancy, for which You are summary. Select only those companies, which, at- your opinion, need to sign summary. Remove excess from the text information. Get, to make the text brief. Fill a summary of key words and brand names. The complete text of the beat, easy to read. Detailed version of a resume, in which You write all organizations, which worked. While we confine ourselves to their name, dates of employment and position. Note the early periods of the career. This can be companies, You worked seven years ago. Note jobs, You have had in the last ten years. If You worked unofficially, we also provide this information. Заполняя раздел «опыт работы» в резюме, дополняйте информацией только те пункты, которые максимально соответствуют данной вакансии. Описывать функции и достижения требуется для компаний, отвечающим запросам работодателя. For other companies restrict the name, post, period of work. LLC "DTEK ", engineer for energy, 2016-2017 g.
To what extent was the supply of electricity? How many employees were involved in the production? That is useful to the bidder for the organization? Unlikely, looking for a worthy candidate for an opening, a recruiter will contact All applicants, to get an answer to his questions. So, write with increasing accuracy, in accordance with the recommendations, described in this article. Remember, that describing their skills, preference will be given to the owner summary with more specific information. It is important: indicate Your achievements at previous jobs with specific numbers and results. Completely throw out vague phrases and wording such as "installation links", "acquisition experience", "head" and t. d. All confirm numbers and real-world examples: "Increased level of production of concrete products for 20 %". Two well-written paragraph will be enough, to highlight Your resume among other applicants. When the summary reflects a number of vacancies with the same duties and achievements, the recruiter will immediately catch the eye, that the applicant is not inclined to professional growth. So tell me about even the small achievements, if they surpassed Your achievements in the previous job. Make a summary so, so your employer could see, You have successfully moved up the career ladder. In this case you need to leave the old company name, but to specify a new position and the company, You had it. To complement this item need a list of new responsibilities and success. Do not write about employment in companies, which have nothing to do with the new job. So, getting an accountant, it would be superfluous to mention the position of bartender in a nightclub. Write only truthful information. Do not invent companies, which never existed. You should not take full credit for it, after all, we are confident, what is your track record will be found achieve, that sounds like You.